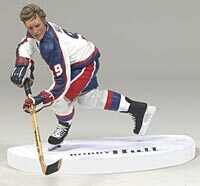 On January 19, 2008, every fan attending the Phoenix Coyotes game will receive an exclusive SportsPick figure of Bobby Hull in his Winnipeg Jets jersey. The figure will be of the miniature variety, standing about 3 inches tall. Both Todd McFarlane (the owner of McFarlane Toys) and Bobby Hull will be in attendance at that … Continue reading "Bobby Hull exclusive figure in Phoenix"